What a fantastic day we had last Saturday! So we are happy to say that it all came together in the end and I think it was a success ! The most important thing was that we had lots of happy customers and got some great feedback. So a BIG thank you to you all for letting us share our passion for treats with you! We both took Thursday and Friday off work to prepare for the day. We were baking like mad from Thursday (till Saturday early morning ... I mean very early morning). To ease the stress Mary had some music on and singing at the same time (her poor neighbours had to put up with her singing and the smell of cakes with the torture of not getting any). Gracie was up to her eyeballs in cake batter... cheesecake mixing and watercolours ! Oh yes, watercolours indeed. In a moment of 'inspiration', she decided that we would bring our cakes to life in a customised menu... she had much fun with it... maybe too much fun, as it detracted from the baking which then had to go on until the wee early hours of Saturday morning... Probably not helped by her typical 'last minute' alterations to her cake designs either ;) - the fiddly work of the chocolate surrounds took longer than she had anticipated, though were definitely worth the effort...! Our first customer was a toddler girl who had been curiously watching this flurry of activity with her father whilst we were setting up... She picked the 'OoOoo Chocolate' cupcakes - which turned out to be a shrewd choice as it ended up being our best seller and were quickly sold out before we knew it! As the day progressed, our cakes, truffles and other sweet temptations were rapidly disappearing before our eyes. We received positive feedback throughout the event, with many asking us whether we have our own cafe/shop... So that was very encouraging ! By the end of it all we were both completely shattered and ready for a good night's sleep ! :) Once again, thanks for all the great feedback... would love to hear what you the rest of you thought ! 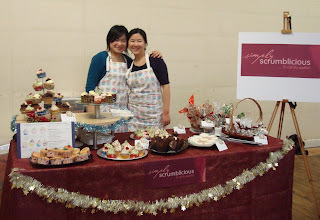 It was great to have you at the fair, all you cakes and chocolates looked truely scrummy. The ones I sampled were definately lovely, he he. I think it was clear to everyone that you have a passion about what you make and you were a perfect addition to our fair. We hope you will be back at future fairs. Happy christmas and new year to you both.